For this publisher profile, we speak to digital publishing company Between 10and5 about their daily website 10and5.com, and what channels they’re using to promote their content. 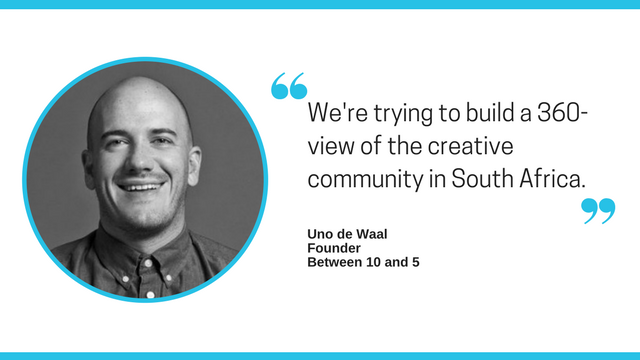 Uno de Waal is the Founder of 10and5, South Africa’s largest online creative showcase. Since starting in 2008, the website has been heralded as one of the most influential blogs in South Africa. They’ve taken home awards from the African Blogger Awards and Bookmark Awards for elevating the creative community in the country, with over 31,000 unique browsers a month. We spoke to Uno about 10and5, and what his team are doing to nurture his loyal readership and keep position in their niche industry. Tell us about the digital media property you represent – what is your point of difference? Since starting 10and5, we’ve really grown to become one of the larger media properties for the creative community in South Africa. We’ve developed a sizable audience, that we’re now able to activate through a number of channels – our audience network, our branded content or our events, we’re trying to build a 360-view of the creative community in South Africa. Tell us about your audience. Has your audience changed over the last year? We’ve managed to break through to a younger audience, while still maintaining our core 24-35yo market. Since we’ve launched our YoungSA and Fresh Meat Series (both profiling under 25’s) we’ve created a whole new audience segment. The audience itself is still in that creative class – people who are filmmakers, designers, photographers, copywriters and people who work in advertising. It’s not necessarily a “hipster” crowd, but rather a broader creative target market. We’re also growing our network by bringing onboard representation of other titles, or launching our own. We have one new title planned for the year, and then we are currently in talks to be the sole South African representative of one of the largest men’s fashion, lifestyle and music publishers globally. What are you doing in terms of advertising? We’ve launched our branded content studio in the middle of last year that now allows us to create very specific campaigns for brands who want to reach the art and creative audience. We’ve significantly invested in our video division and have been working towards growing that video audience and social reach in video. We then also play around with some interesting formats like programmatic and in-feed distribution of our content. I really think we’re one of the first movers in the publishing space to play around with ideas like Audience Extension, remarketing and look-a-like audiences. That’s exciting because we’re already on to the next thing. What do you use Narratiive for? What value do you get out of our products? We use the tools to compare the markets and see who is doing what. It helps us get a benchmark for where other segments are performing and how their audiences develop. Generally it’s been quite good to see how the audiences have matured in South Africa. I think as a niche player in the industry it’s good to have something to work upwards to. Thinking about advertising with 10and5.com? Download their sales deck. Learn how we help advertisers hypertarget their programmatic advertising and publisher earn revenue from their audience data.